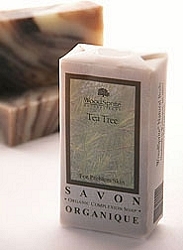 Utilizing the powerful healing properties of pure Australian organic tea tree oil and balanced with soothing organic comfrey root, this complexion soap helps to improve troubled skin. Use regularly on face or body to combat eczema, psoriasis or acne. Ingredients: Saponified Oils of *Extra Virgin Organic Olive, *Organic Coconut, *Organic Palm, *Organic Castor and *Organic Golden Jojoba; *Organic Comfrey Root; *Organic Tea Tree, *Organic Peppermint & Sweet Birch Essential Oils. (*Certified Organic) Oily or troubled skin. 4 oz. wt.